A new study has found that the Antarctic Ice Sheet began melting about 5,000 years earlier than previously thought coming out of the last ice age – and that shrinkage of the vast ice sheet accelerated during eight distinct episodes, causing rapid sea level rise. The international study, funded in part by the National Science Foundation, is particularly important coming on the heels of recent studies that suggest destabilization of part of the West Antarctic Ice Sheet has begun. Results of this latest study are being published this week in the journal Nature. It was conducted by researchers at University of Cologne, Oregon State University, the Alfred-Wegener-Institute, University of Hawaii at Manoa, University of Lapland, University of New South Wales, and University of Bonn. 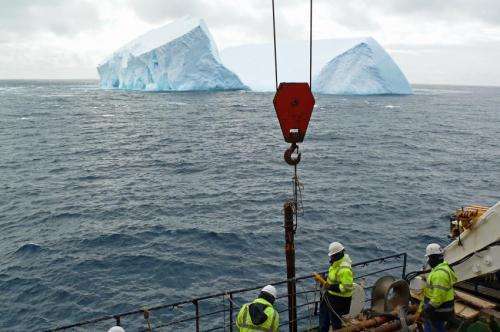 The researchers examined two sediment cores from the Scotia Sea between Antarctica and South America that contained "iceberg-rafted debris" that had been scraped off Antarctica by moving ice and deposited via icebergs into the sea. As the icebergs melted, they dropped the minerals into the seafloor sediments, giving scientists a glimpse at the past behavior of the Antarctic Ice Sheet. Periods of rapid increases in iceberg-rafted debris suggest that more icebergs were being released by the Antarctic Ice Sheet. The researchers discovered increased amounts of debris during eight separate episodes beginning as early as 20,000 years ago, and continuing until 9,000 years ago. The melting of the Antarctic Ice Sheet wasn't thought to have started, however, until 14,000 years ago. "Conventional thinking based on past research is that the Antarctic Ice Sheet has been relatively stable since the last ice age, that it began to melt relatively late during the deglaciation process, and that its decline was slow and steady until it reached its present size," said lead author Michael Weber, a scientist from the University of Cologne in Germany. "The sediment record suggests a different pattern – one that is more episodic and suggests that parts of the ice sheet repeatedly became unstable during the last deglaciation," Weber added. The research also provides the first solid evidence that the Antarctic Ice Sheet contributed to what is known as meltwater pulse 1A, a period of very rapid sea level rise that began some 14,500 years ago, according to Peter Clark, an Oregon State University paleoclimatologist and co-author on the study. The largest of the eight episodic pulses outlined in the new Nature study coincides with meltwater pulse 1A. "During that time, the sea level on a global basis rose about 50 feet in just 350 years – or about 20 times faster than sea level rise over the last century," noted Clark, a professor in Oregon State's College of Earth, Ocean, and Atmospheric Sciences. "We don't yet know what triggered these eight episodes or pulses, but it appears that once the melting of the ice sheet began it was amplified by physical processes." 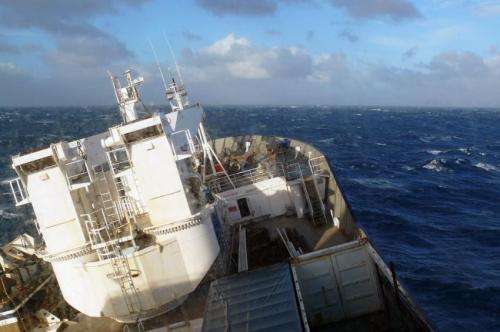 The researchers suspect that a feedback mechanism may have accelerated the melting, possibly by changing ocean circulation that brought warmer water to the Antarctic subsurface, according to co-author Axel Timmermann, a climate researcher at the University of Hawaii at Manoa. "This positive feedback is a perfect recipe for rapid sea level rise," Timmermann said. Some 9,000 years ago, the episodic pulses of melting stopped, the researchers say. "Just as we are unsure of what triggered these eight pulses," Clark said, "we don't know why they stopped. Perhaps the sheet ran out of ice that was vulnerable to the physical changes that were taking place. However, our new results suggest that the Antarctic Ice Sheet is more unstable than previously considered." 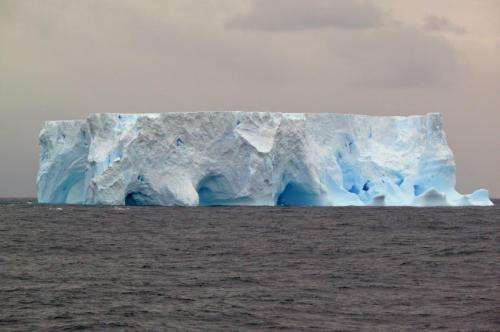 Today, the annual calving of icebergs from Antarctic represents more than half of the annual loss of mass of the Antarctic Ice Sheet – an estimated 1,300 to 2,000 gigatons (a gigaton is a billion tons). Some of these giant icebergs are longer than 18 kilometers. Are you, by any chance, the love child of Rygg2 and Cantdrive? I suspect that global warming is caused by all those millions of cappuccino machines chugging away all over the planet. Don't hold me to it, but I think this is yet another reincarnation of Zephir. full-diaper gave me a one rating for that, so maybe he knows it isn't zephir? I still think it is though - let's see where the little moron ranks this one lol!! Maggy: How do you tell who is rating the posts now. I used to be able to go into my profile and see who was ranking what. However, I don't see that option anymore. I lost that ability when I lost the PM capability. I just went to your profile page, clicked see all and a new page opened showing who has voted on your comments. Thanks VietVet. I appreciate the tip. Truck Captain also set me straight. Who were you with and where in Vietnam if you don't mind? I spent my time on both coasts on a gasoline tanker and a small boat repair ship. Mostly brown water. I knew the coast from Da Nang to Cua Viet pretty well. On your own profile, go to "All" and click it. Can we please have comments related to the article, and not jabber and babbling. Interesting to note the rapid rise of of ocean several thousand years ago. How do we know that it was antarctic ice melt, rather than intense rain and a global flood? And you have raised humor to a very high level tonight. I would have loved to have given you a 10 for this comment but I have to remain satisfied with a mere 5. Great job. I Second this... darn near cost me a brand new laptop spitting my coffee all over it! This will be somewhat redundant for readers of another thread after rggy challenged my being a vet. As a Marine I served from Oct 66- Dec 69. Except for a month at Vietnamese language school at China Beach in Da Nang my first 13 months were spent in northern I Corps----Dong Ha, Con Thien, Cam Lo, Khe Sahn, Laos(briefly), and a lot of ground in between. In Jan. 68 I got the transfer I had hoped for to 3rd Combined Action Group in Phu Bai. Our AO streched from Hue to Phu Loc and I got to know that area quite well over the next 23 months. I spent my first 14 months in northern I Corps, not 13. The view of the South China Sea and Da Nang harbor from Hai Ban was spectacular, how was your view from the water? And when did you serve? I served two tours in-country from 69-71. The view from the water was amazing. I got to watch Puff work out at Cua Viet often. I had the amazing experience of having the New Jersey fire over my head from a quarter of a mile off our starboard side. I got to see the ocean in all conditions for two years. As I always said, I had it a lot better than anyone not on ships. You ground pounders had the tough part.